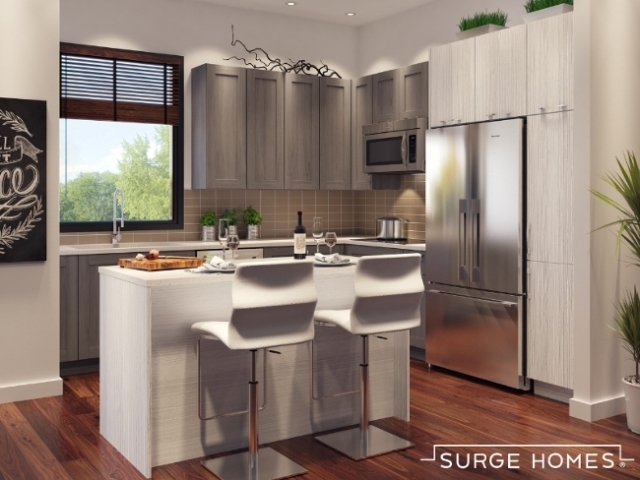 Surge Homes reveals a collection of 68 interior design packages for its new homes, including ensembles for 41 kitchens and 27 bathrooms. An unprecedented number, these packages include selections for flooring, cabinetry, backsplash, countertops and wall tiles. Surge Homes, a developer/builder launching nine communities in Houston, curated these interior design packages over a period of 18 months by utilizing a unique crowdsourcing process that allowed 3,400 potential home buyers to select and rate their preferences for design, materials and color palettes. The interactive process also involved liaising with European materials manufacturers who took participant feedback from the first round of selections and provided additional materials that corresponded to these preferences when presenting the final round of selections. A statistical analysis of all participant ratings resulted in the top selections for flooring, cabinetry, backsplash, countertops and wall tiles, and provided the basis for a collaboration with in-house designers from Surge Homes and Sarah Ciesla of November Design Group to create beautifully coordinated ensembles that will be available in each new condominium, townhome or single-family home. "We know our home buyers will like these interior design packages because we used designs and materials they selected through the many interactive events during our crowdsourcing process," said Ben Lemieux, co-owner of Surge Homes. As a result, Surge Homes signed an exclusive agreement with Tendances Concept, a French-Canadian kitchen and bathroom cabinet manufacturer, to export award-winning cabinetry from Europe for all of the Surge Homes communities. There are a variety of cutting-edge designs and finishes not found with any other builder in the Greater Houston Area. The luxury, all-inclusive, base finishing packages featured in this collection are found in each and every Surge Homes residence. Choices in cabinetry, materials and finishes feature both modern and traditional styles ensuring there is something to suit each home buyer's taste. Louis Conrad, Surge Homes co-owner, said, "No other urban builder in Houston offers a collection of professionally coordinated interior design packages with this level of sophistication and such a wide variety of choices, which provides the homeowner with a hassle-free design process." Surge Homes really does live by its slogan, Where Quality Meets Design®. The collection is available for viewing at the Surge Homes Discovery Center.